Well, this series has gotten nothing but better as it has gone along. I've been thoroughly impressed with Hill's writing and Rodriguez's art right along. They haven't lost anything in the storytelling and haven't weakened in their storytelling either. One of the things that I was worried about is that at some point they would lose their momentum, but five volumes in and that hasn't happened yet. In Volume 2, Head Games, the kids are still recovering from the events at the end of Welcome to Lovecraft, events that may brought back a lot of memories that they were trying to forget. Kinsey and Tyler find some companionship in their new friend Zack, not realizing Zack's dark secret or intentions. 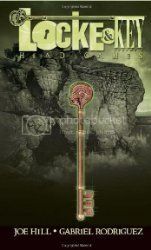 Bode finds a new key, and as they start to uncover the secrets of this new game, Zack starts to become a little too recognizable for his liking. 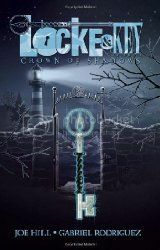 Volume 3, Crown of Shadows, finds more secrets and more revelations in the background about Dodge and more keys. This volume deals a little bit more with the emotional impact prior events have had on each of the members of the Locke family. I really found these issues handled well in this volume, especially watching Kinsey after her change in the previous volume. 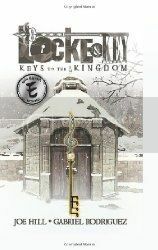 Volume 4, Keys to the Kingdom, was a series of shorter stories that all tied into the Key house and what is happening with the various characters. While not necessarily on complete story throughout the entire volume, each of these stories still successfully moves the story along. 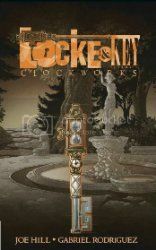 I was concerned about going into Volume 5, Clockworks, as I'd heard that this was mostly a background story, and I wasn't exactly sure how a volume dedicated almost entirely to background was going to help move the story along, but holy crap was I wrong! I think this might be the best volume so far. We learn about the history of the Locke family, the Keys, Key house, the purpose of the villain behind everything (SPOILERS! - which ties directly in the title of the first volume). It just all came together amazingly well. Needless to say, you won't find much about the actual story in this review, because it's almost impossible to talk about the story without giving anything away, as Hill seems to find a way to tie in almost every plot thread one way or another into all of the story. What I can say, is that this is completely worth reading and might be one of the better graphic novels you'll find. If you're not a fan of horror or of violence, this might not be the best series for you, but if you can stomach it, this is a fantastic series. I'll definitely be picking up the final volume when it's released.